What is it? 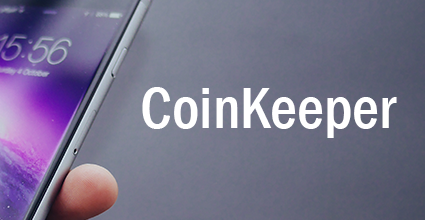 CoinKeeper is a budgeting app with a drag-and-drop physical response to make your money feel real. It tracks spending and cash flow to give you a better idea of where your money’s going. Who’s it for? Freelancers, budget fanatics, people who are plugged into digital money management. What platforms? iOS and Android. Cost? Free on Google Play or iTunes store with a Premium level ($1.33 monthly subscription) or Platinum level ($4.50 monthly subscription) for various premium features. One of the dangers of the gig economy is that the money you earn doesn’t “feel” real. It all goes through online services where you can see your balance, then it all-too-easily goes back out again. Without a paycheck or cash, money can seem unreal, encouraging over-spending. One way to combat that reality is with drag-and-drop budgeting tool, CoinKeeper. The tool allows you to create coins that represent your various streams of income, like account transfers, paychecks, freelance gigs and so on. When it comes time to spend your hard-earned cash, you just drag one of the coins into a category. The app makes a great coin-hitting-piggybank sound, and then it gives you the opportunity to enter an amount. Adding that extra step in the spending process can really make you think twice before confirming an impulse purchase. Knowing that you’ll have to actually move money from income to a budget category can provide the time to realize you don’t really need what you’re buying. That moment of hesitation can make a big difference to your budget. You can use the same spending action to put money into savings “pockets” for goals. You can take money out of your income and put it into a category called “vacation,” for which you’ve previously set a goal. The app lets you see the progress you’ve made toward your goals, and you can even include those designated savings in your monthly budget. The app really does make budgeting a breeze under certain circumstances. There are some cumbersome defaults that can make the process somewhat annoying. For example, the app will only work with monthly budgets. So, if you get paid twice a month, you have to manually add those checks together. If you pay quarterly taxes, you’ll have to break down your payments into months in order to accurately track expenses. CoinKeeper provides some excellent benefits, although its interface can be a bit stodgy at times. In general, it’s a very functional, very pretty app that has a lot of neat features to make budgeting a breeze. If you’re looking for a hands-on approach to budgeting your digital money, CoinKeeper may be just the answer.